This website is dedicated those Danes who served in the armed forces of the British Empire, fighting in wars, campaigns and battles all over the world. Some of them made the ultimate sacrifice, and are now burried very far from their country of birth, Denmark. 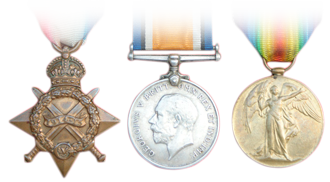 I am a very keen collector of medals awarded to the Danish-born soldiers, sailors and airmen, who served with the Commonwealth forces. I enjoy researching the stories of the individuals behind the medals and feel that in so doing, I have helped to keep their memories alive. I am hoping to cataloge the Danes who served in the Commonwealth forces. I was primarily compiling a database containing information on the 2.449 Danes who served in the British Army between 1945 and 1948, but I have included other periods as well. The work on the database is an ongoing process. It's possible for the visitor to add entries to categories visible in the database section. Please do not hesitate to do so.